YOUNTVILLE, Calif. — It was a strange scene on an autumn afternoon in California’s Wine Country: people walking up and down Yountville’s main street wearing surgical masks. Across the Bay Area, residents took precaution as the raging Camp Fire’s massive smoke plume enveloped the region, prompting authorities to classify air quality in some parts as unhealthy, CBS SF Bay Area reports. Many residents awoke Friday with their homes filled with the smell of burning wood. 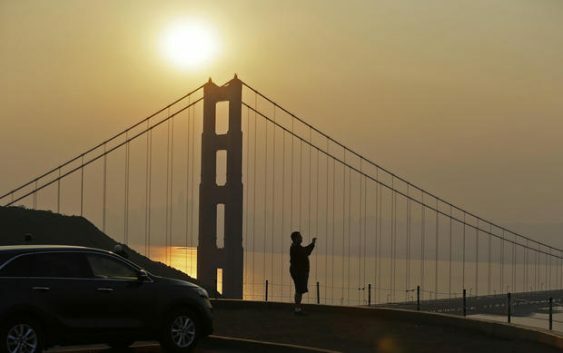 Officials issued an air quality advisory for smoke for the Bay Area region starting Thursday and lasting through Friday. The Bay Area Air Quality Management District also issued a Winter Spare the Air Alert, making it illegal to use fireplaces, wood stoves, pellet stoves or fire pits while the alert is in effect. Officials advised children and older people to move any physical activities indoors, while everyone was encouraged to limit their outdoor activity. According to the federal EPA air quality site, Alameda, California, had an unhealthy air index of 165 and a particle pollution measure of PM2.5. That’s the same particle pollution measurement as Beijing, China — a city notorious for some of the worst air pollution in the world. Smoke from wildfires obscures the San Francisco skyline behind the Golden Gate Bridge on Nov. 9, 2018, near Sausalito, California. The poor air quality forced officials at Santa Rosa Junior College and Sonoma State University to cancel Friday classes. “Due to projections that the air quality in Sonoma County will not improve by tomorrow, all #SRJC campuses and sites will be closed through Friday, Nov. 9 and all classed and activities will be canceled,” said a statement from the community college. “The air quality at Sonoma State University remains poor due to the fires in Butte County and is projected to stay at unhealthy levels at least through Friday. As a result, the decision has been made to cancel Friday classes and suspend normal business operations for the day,” said a statement from the CSU school. “We can hold him in contempt”: Will Zuckerberg address officials?